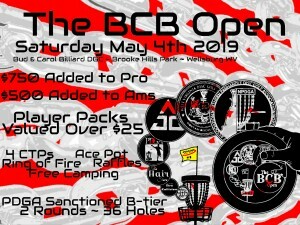 Players Packs Valued over $25, Choice of a Premium Disc, Custom Towel, Re-usable Score card and more! $5 CTP- holes 8 & 17, Both Mystery Boxes Valued over $45!! Raffle Items, loads of goodies including an Innova Basket! Ring of Fire, loads of goodies here too! Burger or Hotdog w/chips & drink $5 at HQ! Liscenced Massage Therapists will be on hand!! Minimum of 3 players is needed to create a division. If there are not 3 players in any given division you may be asked to play another division. Don't see your division listed? Message us and we will get it up! The Northern Panhandle Disc Golf Association is responsible for all refunds/cancelations. Begins when last card is turned in.